Let your treasures shine and your collectibles be displayed with this set of 2 wall mounted wooden shelves. These shelves feature a wood construct with a rustic whitewash finish that can be incorporated into any space. Each shelf features ornate brackets so you can easily mount them to any wall with proper mounting hardware. Mount them in your bathroom for extra hand towels, candles, lotions or decorative decor. Create extra storage in your kitchen or bar area for cocktail mixers, spices, oils, cookbooks or barware. Add a rustic element to your living or bedroom for books, photos, memorabilia and so much more. 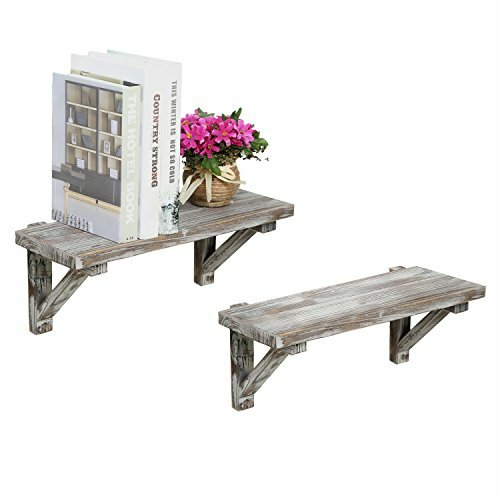 Approximate Dimensions (in inches): 6.5 H X 16.5 W X 6.5 D.
Country style solid wooden shelves with rustic torched wood finish. Features a set of 2 torched wood shelves with ornate wooden wall brackets. Perfect for decorating or organizing your walls with books, memorabilia, collectibles, photos, and so much more.